The eukaryotic green alga, Chlamydomonas reinhardtii, produces H2 under anaerobic conditions, in a reaction catalysed by a [Fe-Fe] hydrogenase HydA1. For further biochemical and biophysical studies a suitable expression system of this enzyme should be found to overcome its weak expression in the host organism. Two heterologous expression systems used up to now have several advantages. However they are not free from some drawbacks. In this work we use bacterium Shewanella oneidensis as a new and efficient system for expression and maturation of HydA1 from Chlamydomonas reinhardtii. Based on codon usage bias and hydrogenase maturation ability, the bacterium S. oneidensis, which possesses putative [Fe-Fe] and [Ni-Fe] hydrogenase operons, was selected as the best potential host for C. reinhardtii [Fe-Fe] hydrogenase expression. Hydrogen formation by S. oneidensis strain AS52 (ΔhydAΔhyaB) transformed with a plasmid bearing CrHydA1 and grown in the presence of six different substrates for anaerobic respiration was determined. A significant increase in hydrogen evolution was observed for cells grown in the presence of trimethylamine oxide, dimethylsulfoxide and disodium thiosulfate, showing that the system of S. oneidensis is efficient for heterologous expression of algal [Fe-Fe] hydrogenase. In the present work a new efficient system for heterologous expression and maturation of C. reinhardtii hydrogenase has been developed. HydA1 of C. reinhardtii was purified and shown to contain 6 Fe atoms/molecule of protein, as expected. Using DMSO, TMAO or thiosulfate as substrates for anaerobic respiration during the cell growth, 0.4 – 0.5 mg l-1(OD600 = 1) of catalytically active HydA1 was obtained with hydrogen evolution rate of ~700 μmol H2 mg-1 min-1. Biohydrogen has great potential as a non-polluting, non-fossil fuel which can be produced at the point of end use without the release of greenhouse gases. The most efficient H2-generating catalysts are the hydrogenases which are present in several microorganisms including photosynthetic microalgae Chlamydomonas reinhardtii. Hydrogenases are metalloenzymes that reversibly catalyse the reaction: H2↔2H++ 2e-. There are three classes of hydrogenases: [Fe-Fe], [Ni-Fe] and [Fe-S]-cluster-free hydrogenases [1, 2]. The [Fe-Fe] hydrogenases mainly catalyse the reduction of protons to yield dihydrogen with high efficiency. They are irreversibly inactivated by oxygen. C. reinhardtii is a eukaryotic green alga which contains two monomeric [Fe-Fe] hydrogenases: HydA1 and HydA2 . Both proteins are encoded by nuclear genes. The hydA2 gene encodes a protein that is 74% similar and 68% identical to HydA1. HydA1 mediates a light-driven hydrogen evolution following anaerobic adaptation of the algae . The structure of the HydA1 H-cluster is composed of a [4Fe-4S]-centre bridged through a cysteine amino acid to an unusual 2Fe-centre. Unlike many other [Fe-Fe] hydrogenases, HydA1 does not have any 2 [4Fe-4S] electron transfer domains and is directly reduced by a [2Fe-2S] ferredoxin . The specific function of HydA2 is not known. Two maturation proteins, HydEF and HydG, are required for the assembly of active HydA1 . Homologous expression of HydA1 leads to a low yield of active enzyme . Heterologous expression of HydA1 has been previously performed in Clostridium acetobutylicum using endogenous maturation enzymes  and in Escherichia coli using a heterologously expressed maturation system [6, 8]. The former experiments using C. acetobutylicum resulted in the purification of 0.1 mg of HydA1 per liter of culture with hydrogen evolution rates of 760 μmol H2 min-1 mg-1 . The opposite situation appeared with the E. coli expression system which resulted in a higher amount of enzyme (0.8 – 1 mg of HydA1 per liter of culture) but with hydrogen evolution rates of 150 μmol H2 min-1 mg-1 . It is known that many organisms show particular preferences for one of the several codons encoding a given amino acid. A rare codon is defined as used by an organism at a frequency lower than 0.5%. Rare codons are capable of causing qualitative and quantitative expression difficulties [9, 10]. In order to overcome these difficulties, we decided to search for organisms having not only a Hyd maturation system, but also low rare codon usage rates for hydA1. We first analysed the rare codon usage rate of hydA1 in different organisms carrying demonstrated or putative homologues of HydA1, HydEF and HydG. The closest match in codon usage between hydA1 and a possible host organism for expression of the protein was obtained with the bacterium Shewanella oneidensis. S. oneidensis is a facultative anaerobe that can be easily and rapidly grown, and which possesses a large and diverse set of metalloproteins. It exhibits extensive respiratory versatility and can use organic, inorganic or metallic substrates during anaerobic respiration. The whole S. oneidensis genome has been sequenced . This has shown that S. oneidensis possesses [Ni-Fe] and [Fe-Fe] hydrogenases, encoded by hydA ([Fe-Fe]) and hyaB ([Ni-Fe]). Global transcriptome analysis of S. oneidensis exposed to different terminal electron acceptors by Beliaev et al. revealed that the [Fe-Fe] hydrogenase gene (hydA) is expressed under thiosulfate-respiring conditions and no induction was observed under Fe(III), nitrate, fumarate, TMAO and DMSO-respiring conditions. The physiological significance of hydA gene induction in the presence of thiosulfate is not known. In the present study, hydrogen formation by C. reinhardtii HydA1 expressed in S. oneidensis strain AS52 (ΔhydAΔhyaB) and grown in anaerobic conditions with six different substrates was measured, showing that S. oneidensis maturation enzymes are able to mature heterologously expressed [Fe-Fe] hydrogenase. In contrast to the transcriptome analysis by Beliaev et al. , we observed a significant increase of hydrogen formation due to the presence of the S. oneidensis [Fe-Fe] hydrogenase (HydA) with three substrates (trimethylamine oxide (TMAO), dimethylsulfoxide (DMSO) and disodium thiosulfate), compared to anaerobic conditions in the presence of other added respiratory substrates. This may be due to post-transcriptional regulation of S. oneidensis [Fe-Fe] hydrogenase synthesis. After purification, 400 – 500 μg of catalytically active HydA1 were obtained from 1-liter culture (OD600 = 1) with specific activities of approximately 700 μmol H2 min-1 mg-1 under TMAO, thiosulfate or DMSO-respiring conditions. The enzyme contained six atoms of iron per molecule of protein, thus we can conclude that maturation was homogeneous and complete. The S. oneidensis strains used in this study are listed in Table 1. S. oneidensis MR-1 strain was obtained from Institut Pasteur (Paris, France). Strains AS50, AS51 and AS52 were obtained from Stanford University (Palo Alto, CA, USA). All strains were grown aerobically at 28°C in M72 medium (casein digest peptone 15 g/L, papaic digest of soybean meal 5 g/L, sodium chloride 5 g/L, pH 7.8). For hydrogen formation studies with different substrates for anaerobic respiration, 100-ml cultures of S. oneidensis were grown anaerobically overnight in M72 medium containing 20 mM lactate and 20 mM Hepes pH 7.9, together with one of the following substrates: ferric citrate (10 mM), dimethylsulfoxide (DMSO, 10 mM), trimethylamine N-oxide (TMAO, 10 mM), disodium thiosulfate (20 mM), sodium nitrate (10 mM), or fumarate (20 mM). Cells were collected anaerobically by centrifugation (15 min, 9800 × g, 4°C). For HydA1 expression, S. oneidensis AS52A1N strain was grown overnight at 28°C in gas-tight bottles containing 1 liter of anaerobic M72 medium supplemented with 20 mM lactate, 20 mM Hepes pH 7.9 and one of the following substrates: 20 mM disodium thiosulfate, 10 mM TMAO or 10 mM DMSO. Kanamycin (50 μg/mL) was added in both preculture and culture media. After centrifugation (see above) the cells were resuspended in 1 ml breaking buffer (see below) and samples were diluted in a solution containing 50 mM Tris/HCl pH 6.7, 20 mM Na-dithionite and 5 mM methylviologen as the electron donor. After purification (see below) hydrogenase samples were diluted in a solution containing 50 mM Tris/HCl pH 6.7, 20 mM Na-dithionite and 5 mM methylviologen as the electron donor. In both cases hydrogen evolution was measured by amperometry using a modified Clark-type electrode (Hansatech, UK). The amplitude of the electrical signal from the electrode was standardized using an aliquot of H2-saturated solution as a reference. The plasmids used in this study are listed in Table 1. All the constructions were performed in E. coli (strain XL1-Blue ) and then used to electrotransform S. oneidensis. Plasmid pBBR1-MCS2  was used for C. reinhardtii hydA1 cloning under control of lac promoter. Expression under this promoter is repressor-independent (lacI-) and is regulated only by glucose repression-derepression. To construct pBBR1-MCS2 N-terminal Strep tag II, two complementary DNA primers, TAGF 5'-CGGAGGACGTTTATGGCTAGCTGGTCCCACCCGCAGTTCGAAAA GATCGAAGGGCGCA-3'and TAGR 5'-AGCTTGCGCCCTTCGATCTTTTCGAACTGCG GGTGGGACCAGCTAGCCATAAACGTCCTCCGGTAC-3' were hybridizated, phosphorylated and cloned in KpnI-HindIII sites of pBBR1-MCS2 . TAGF contains a ribosome binding site (RBS), a start codon, Strep-tag II and factor Xa DNA sequences. To construct pBBR1-MCS2 C-terminal Strep tag II, two complementary DNA primers, TAGFC 5'-TCGACTGGAGCCATCCGCAATTTGAAAAATAAG-3' and TAGRC 5'-GATCCTTATTTTTCAAATTGCGGATGGCTCCAG-3' were hybridized, phosphorylated and cloned in SalI-BamHI sites of pBBR1-MCS2 . TAGFC contains a Strep-tag II and a stop codon sequences. To construct pBBR-hydA1N, the hydA1 sequence was amplified by PCR from the plasmid pA139 (from Kazuza DNA Research Institute, Japan ), which carries the hydA1 gene from C. reinhardtii. The first 165 5'nucleotides were deleted. The PCR product was cloned in PCR4BLUNT-TOPO (Invitrogen, Cergy Pontoise, France) and subcloned in HindIII-EcoRI sites of pBBR1-MCS2 N-terminal Strep-tag II. To construct pBBR-hydA1C, the hydA1 sequence was amplified by PCR from the plasmid pA139, which carries hydA1 from C. reinhardtii. The first 165 5'nucleotides and the stop codon were deleted. 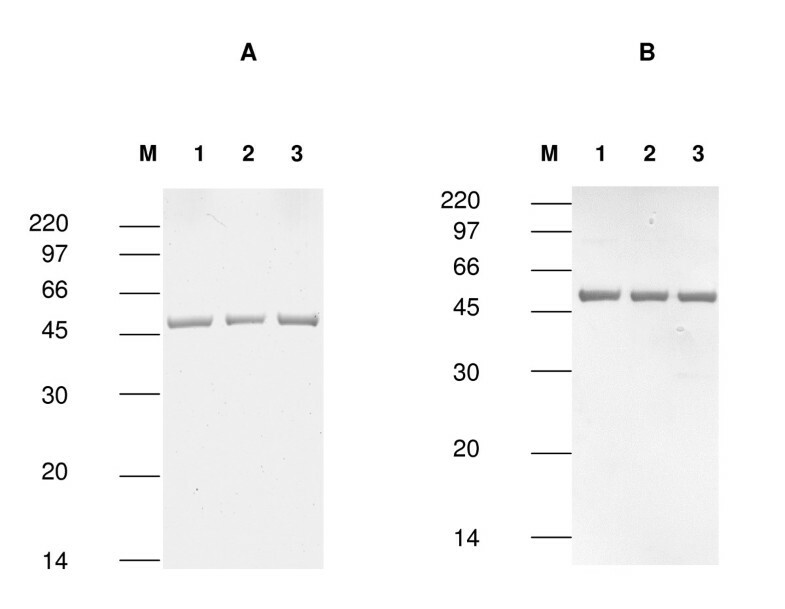 The PCR product was cloned in PCR4BLUNT-TOPO and subcloned in KpnI-SalI sites of pBBR1-MCS2 C-terminal Strep-tag II. Electrotransformation of S. oneidensis was performed as previously described , resulting in the strain AS52A1N when AS52 was transformed with pBBR-hydA1N and in the strain AS52A1C when transformed with pBBR-hydA1C. All the purification steps were carried out under a purified nitrogen atmosphere, in a glovebox (Jacomex, France) maintained at < 1 ppm O2. After 17 h of growth, the bacteria were recovered by centrifugation (9800 × g, 15 min, 4°C). The pellets were resuspended in breaking buffer (150 mM Tris/HCl pH 8, 100 mM NaCl, 5% (w/v) glycerol, 2 mM Na-dithionite, 0.3 nM avidin, 1 mM PMSF, 10 μg/ml DNase, 10 μg/ml RNase). Cells were broken using a French pressure cell (15.2 kPa) and centrifuged (5200 × g, 30 min). The supernatant was transferred to a Q-Sepharose FF 2 ml column (Sigma-Aldrich, Saint Quentin Fallavier, France) equilibrated in 25 mM Tris/HCl, 2 mM Na-dithionite at pH 8.5. Strep-tagII-HydA1 was eluted with a NaCl gradient (50–500 mM), and elution of the active fraction occurred at 250 mM NaCl. The second purification step was affinity chromatography on a 1 ml Gravity flow Strep-tactin Sepharose column as described by the manufacturer (IBA GmbH, Göttingen, Germany). Strep-tag II HydA1 was detected after gel electrophoresis and Western blotting using Strep-tag AP Detection Kit (IBA). Amido-black and Bradford assays were used to measure hydrogenase concentration. The assays were performed as described in references  and , respectively. Iron concentration measurements were performed using a previously described atomic absorption method , and the colorimetric method of Doeg and Ziegler . A short Perl/Tk script was written to obtain data on rare codons: upon providing the NCBI gene number and the Kazusa Codon Usage Database organism name, the script forwards the queries to the relevant databases, compiles the rare codons usage information and displays the gene with rare codons colored differently and a summary of the rare codons usage. The script is available as open-source software at: http://sourceforge.net/projects/codons. HydA1 rare codons were searched for in various organisms using a software that compares genes sequences from NCBI with the codon usage data from different genomes of Kazusa DNA Research Institute (Japan). Rare and very rare codons were defined as used by an organism at a frequency lower than 0.5% and 0.2% respectively (Table 2). hydA1 rare codons occurrences in organisms with sequenced genomes which have putative homologues of C. reinhardtii hydA1, hydEF and hydG. a E. coli has no putative homologues of C. reinhardtii hydA1, hydEF and hydG, but was previously used for HydA1 heterologous overexpression. Gene number was found within the following reference: http://www.ncbi.nlm.nih.gov/sites/entrez?db=gene, organism name was found within reference: http://www.kazusa.or.jp/codon/. The script is available as open-source software at: http://sourceforge.net/projects/codons. The gene sequence of C. reinhardtii hydA1 (source: NCBI) was compared with codon usage data from organisms which possess putative homologues of C. reinhardtii HydA1, HydEF and HydG and from E. coli, which was previously used to synthesize HydA1 but has no putative homologues of C. reinhardtii hydA1, hydEF and hydG. Phyla represented are: 1) the gram negative bacteria: Bacteroides thetaiotaomicron (anaerobe), Desulfovibrio desulfuricans and D. vulgaris (facultative aerobes), E. coli, S. oneidensis (facultative aerobe) and Thermotoga maritima (thermophilic); 2) the gram positive bacteria: Clostridium botulinum, C. difficile, C. perfringens, C. tetani, C. thermocellum and Thermoanaerobacter tengcongensis (thermophilic); and 3) protozoan:Trichomonas vaginalis (Table 2). It must be noted that hydA1 presents less rare codons in gram negative than in gram positive bacteria. The best match was obtained with S. oneidensis (Table 2). The HydA1 producing strains of S. oneidensis AS52A1N and AS52A1C were constructed by electrotransforming the host strain S. oneidensis AS52 (ΔhydAΔhyaB)  with pBBR-hydA1N and pBBR-hydA1C respectively (Table 1). pBBR-hydA1N is a pBBR1-MCS2 derivative carrying N-terminal Strep tag II hydA1 from C. reinhardtii and pBBR-hydA1C is a pBBR1-MCS2 derivate carrying a C-terminal Strep tag II hydA1 gene from C. reinhardtii. The N-terminal 56 amino acids of HydA1, which act as transit peptide  were truncated. The pBBR1-MCS2 vector is a broad host range vector which has been tested and found to replicate in 15 Gram negative bacteria . After cell breakage using a French pressure cell and subsequent centrifugation, N-terminal Strep-tag II-HydA1 was detected in the cell-free extract, while C-terminal Strep-tag II-HydA1 was mostly found in the cell-debris pellet (Fig 1). It should be noted that no hydrogenase catalytic activity was detected in the pellet. 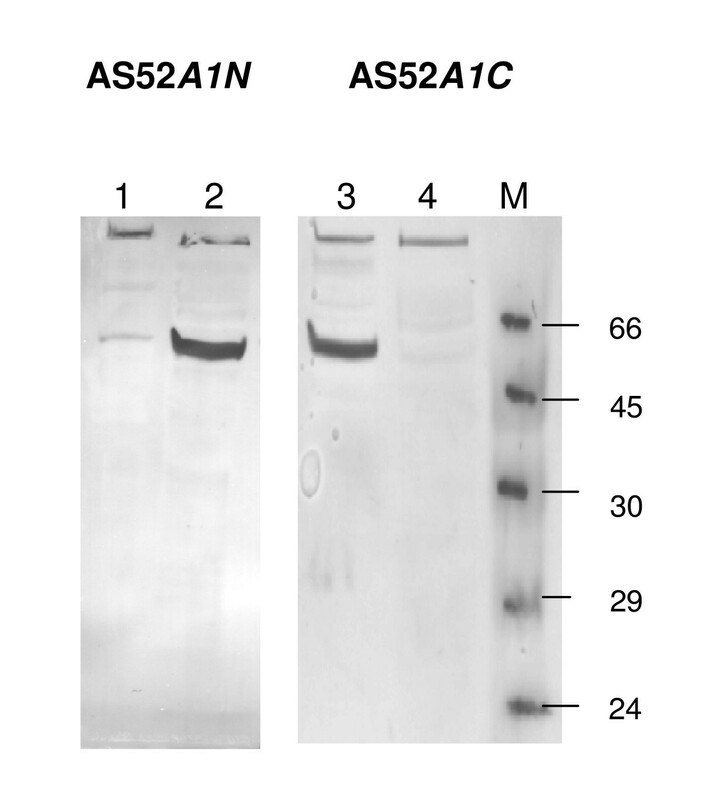 Western blot probed with Strep tactin AP conjugate of StrepII-tagged Cr HydA1 in S. oneidensis AS52 A1N and AS52 A1C strains. Lanes 1 and 3: cell-debris pellet, lanes 2 and 4: cell-free extracts. M: molecular weight marker (kDa). In C. acetobutylicum it was reported that after sonication, the N-terminal Strep-tag II-HydA1 was mostly found in the postsonication pellet, while the C-terminal Strep-tagII-HydA1 was exclusively detected in the supernatant . Thus, the solubility of the tagged protein is most likely influenced by the tag position and by the host strain chosen for the expression. The occurrence of insoluble C-terminal Strep-tagII-HydA1 protein could be due to non-specific interactions between HydA1 and the host bacterium proteins. S. oneidensis uses oxygen as final electron acceptor during aerobic respiration and various organic, inorganic or metallic substrates during anaerobic respiration. Optimal conditions for synthesis of active hydrogenases in S. oneidensis were investigated. The S. oneidensis strain AS52A1N (Table 1) was grown anaerobically in the presence of nitrate, thiosulfate, fumarate, TMAO, Fe(III) or DMSO as substrates for anaerobic respiration. No hydrogenase activity was detected in extracts of cells grown aerobically (data not shown). Under anaerobic conditions, and in the absence of any externally added substrates, H2 evolution activity of 0.02 ± 0.001 μmole H2 min-1 ml-1 for OD600 = 1 was measured for strain AS52A1N (Table 3). Hydrogen formation was approximately the same using fumarate, nitrate or ferric citrate for the strains AS52A1N, AS50 (ΔhydA) and AS51 (ΔhyaB). We observed a significant increase of hydrogen evolution for the strains AS52A1N and AS51 grown in presence of TMAO, thiosulfate and DMSO (Table 3). No hydrogen was detected after exposing the cells to air for 15 minutes (data not shown). Insignificantly small amounts of hydrogen were detected from the ΔhydA strain (AS50) under DMSO-, TMAO- or thiosulfate-respiring conditions (Table 3), showing that under these conditions, hydrogen evolution is only due to the presence of the [Fe-Fe] hydrogenases (CrHydA1 or SoHydA). No hydrogen was detected in experiments using the ΔhydAΔhyaB strain (AS52) (data not shown). It should also be noted that strain AS52A1N produces about 2 times more hydrogen compared to the AS51 (ΔhyaB) strain of S. oneidensis using DMSO, TMAO or thiosulfate as substrates for anaerobic respiration (Table 3). Hydrogen formation from S. oneidensis cells grown in the presence of various substrates for anaerobic respiration. Values are: result ± standard deviation (at least three replicate cultures for all conditions). S. oneidensis strain AS52A1N was used for the production of Strep-tagged HydA1. Three substrates for anaerobic respiration were chosen for cell growth: TMAO, DMSO and thiosulfate. The purification procedure, which involves anion exchange and affinity chromatographies, was performed as previously described by Girbal et al. , except that during the stepwise elution from Q-Sepharose, the algal hydrogenase eluted at 0.25 M NaCl. As shown in Fig. 2 and Table 4, Strep-tagged CrHydA1 was synthesized as an active enzyme using DMSO, TMAO or thiosulfate for cell growth. After purification on a Strep-Tactin column, 0.4 – 0.5 mg of pure algal hydrogenase was isolated from 1 liter of culture (OD600 = 1) (Table 4, Fig 2). Hydrogen evolution rates of about 700 μmol H2 min-1 mg-1 protein, were measured using a hydrogen electrode in the presence of reduced methylviologen as the electron donor (Table 4). Iron quantitation of HydA1 anaerobically expressed in S. oneidensis AS52 (ΔhydAΔhyaB) was done, showing in all cases the presence of 6 Fe atoms/molecule of protein (Table 4). Interestingly, the hydrogen formation rate of purified HydA1 expressed in the wild type strain (MR1) of S. oneidensis under DMSO-respiring conditions was about 5 times lower (135 ± 12 μmol H2 min-1 mg-1) and only 0.6 ± 0.03 atoms of iron were found per molecule of hydrogenase. This result may indicate the preferential maturation of the host [Fe-Fe] hydrogenase by So hydEFG genes. As a consequence the proper expression of CrHydA1 in S. oneidensis needs to be performed in the absence of the endogenous [Fe-Fe] hydrogenase. Specific activities, production and iron quantitation assay of purified CrHydA1 anaerobically expressed in S. oneidensis AS52A1N strain grown with DMSO, TMAO or thiosulfate as substrates for anaerobic respiration. Values are: result ± standard deviation (at least three replicates of all experiments). Gel-electrophoretic analysis of purified, StrepII-tagged Cr HydA1. (A): Coomassie blue staining. (B): Immunoblot detection with Strep tactin AP conjugate. Lanes 1: HydA1 extracted after growth under DMSO-respiring conditions (~1 μg); lanes 2: HydA1 extracted after growth under TMAO-respiring conditions (~1 μg); lanes 3: HydA1 extracted after growth under thiosulfate-respiring conditions (~1 μg). M: molecular weight marker (kDa). Shewanella oneidensis is a metabolically versatile bacterium that can use a diversity of organic compounds and metals to obtain the energy needed for its growth and survival [23, 24]. It is a facultative aerobic Gram-negative bacterium, related to E. coli. The tools and techniques that were developed over the past 30 years for E. coli are compatible with S. oneidensis. In addition, the ability of Shewanella to tolerate oxygen allows easy genetic manipulation in contrast to strict anaerobic organisms. The results of codon usage analysis of hydA1 are consistent with an eubacterial origin of this enzyme . Three of the four best codon usage matches between hydA1 and a possible host were obtained with eubacteria which are closely related in phylogenetic trees:D. desulfuricans, E. coli and S. oneidensis. It is known that the regulation of bacterial hydrogenase gene expression is exerted mainly at the transcriptional level  and responds to four major types of signals: H2, O2, nickel ions, and the electron donors together with available acceptors. In our work, the synthesis of S. oneidensis [Fe-Fe] hydrogenase or exogenously expressed HydA1 of C. reinhardtii was observed using DMSO, TMAO and thiosulfate as respiratory substrates during anaerobic cultivation. This induction is intriguing since, under such growth conditions, one could anticipate that cells do not need an additional respiratory pathway, such as proton reduction by hydrogenase, in order to drain off excess of electrons. No hydrogen production was observed during aerobic respiration. This fits with the well known observation that enzyme complexes that are sensitive to the presence of oxygen are usually not expressed in an aerobic environment. During our studies of hydrogen evolution from S. oneidensis strains grown anaerobically in the presence of various respiratory substrates, we observed the absence of hydrogenase activity with Fe(III), nitrate and fumarate. In contrast, under TMAO-, thiosulfate- or DMSO-respiring conditions a significant increase of hydrogen formation was detected due to the presence of the [Fe-Fe] hydrogenases (CrHydA1 or SoHydA). One may assume that putative [Fe-Fe] hydrogenase operon in S. oneidensis encodes maturation enzymes which are expressed and active under TMAO, DMSO and thiosulfate growth conditions, since mature CrHydA1 or SoHydA is produces under these conditions and not under nitrate, fumarate and Fe(III) conditions. This hypothesis is supported by the fact that the maturation enzymes of S. oneidensis (HydE, HydF and HydG) are capable of activating CrHydA1 in a cell-free system from E. coli . The disagreement with the transcriptome studies conducted by Beliaev et al. concerning SoHydA could be due to post-transcriptional regulation of S. oneidensis [Fe-Fe] hydrogenase synthesis. It was previously shown that S. oneidensis can be electrotransformed directly by the pUC-type universal vectors for E. coli . In this study, vector pBBR1-MCS2 carrying the hydA1 gene of C. reinhardtii was used to electrotransform S. oneidensis strains and it was found to replicate in this bacterium. Using C. acetobutylicum, Girbal et al. isolated about 0.1 mg of algal hydrogenase per liter of culture with hydrogen evolution rates of 760 μmol H2 min-1 mg-1. Similar amounts of the protein were obtained for HydA1 isolated from cultures of C. reinhardtii and Scenedemus obliquus [4, 29]. Heterologous expression of HydA1 in E. coli resulted in a higher amount of enzyme (0.8 – 1 mg of algal hydrogenase per liter of culture), but required a heterologously expressed maturation system and yielded a low rate of hydrogen evolution . In S. oneidensis 0.4 – 0.5 mg of active HydA1 per liter of culture (OD600 = 1) was obtained under TMAO, thiosulfate or DMSO-respiring conditions. Heterologous expression in S. oneidensis of another metalloprotein, cytochrome c3 from D. vulgaris Miyazaki F, yielded 1 mg of protein per liter of culture, compared with 0.3 mg per liter obtained by homologous expression . These results confirm that S. oneidensis is a user-friendly system for heterologous expression of metalloproteins, including hydrogenase. The present work shows that S. oneidensis heterologous production system appears more efficient than that of C. acetobutylicum, for matured [Fe-Fe] hydrogenase expression. The specific activities of purified StrepII-tagged C. reinhardtii HydA1 expressed in S. oneidensis are higher than those of CrHydA1 expressed in E. coli (~700 μmol H2 min-1 mg-1 vs. 150 μmol H2 min-1 mg-1 respectively). The purified HydA1 is fully matured and homogeneous in that it bears the predicted full complement of iron (six atoms of iron per molecule of protein). HydA1 isolated from cultures of C. reinhardtii contained 4 Fe atoms/molecule , while no result on this subject was published concerning HydA1 expressed in C. acetobutylicum  or in E. coli [6, 8]. Heterologous expression of algal [Fe-Fe] hydrogenase in S. oneidensis, a bacterium which is easily manipulated genetically, offers great potential to facilitate enzymatic studies of the [Fe-Fe] hydrogenases as well as investigations of their maturation processes. We are grateful to Dr. A. Spormann from Stanford University for kindly providing the AS50, AS51 and AS52 strains of S. oneidensis. We thank Dr. M. Kovach from Louisiana State University Medical Centre for kindly providing the pBBR1-MCS2 vector. We thank Ms. V. Mary for expert technical assistance and Ms. Thanh-Lan Lai for help with atomic absorption measurements. We are grateful to Dr. A. W. Rutherford for providing helpful comments and critical reading of the manuscript. This work was supported by the Agence Nationale de la Recherche (PhotoBioH2, NT05-2_42699) and the European Commission (STRP SOLAR-H2 516510 and SOLAR-H2 212508). K.S. was supported by a postdoctoral fellowship of the BioHydrogene Program from CEA-DSV. KS and TA cloned, expressed, purified HydA1 hydrogenase in Shewanella deletants and wild type cells respectively. VM participated in the cloning design. PL and HB initiated the study on Chlamydomonas hydrogenase induction and purification. PL, MR and HB designed and participated in the heterologous expression project. VF conceived and wrote the computer program for the codon-usage analysis. KS, TA and HB drafted the manuscript. All authors read and approved the final manuscript.